Which hybrid car provides the best value? While electrified vehicles are becoming a benchmark for today’s roadways, Honda and Toyota remain two of the most notable brands working towards this initiative. The 2018 Honda Clarity Plug-In Hybrid is a direct competitor of the 2018 Toyota Prius Prime Advanced. Both of these models combine battery regeneration technology along with gasoline engines, and pure electric charging to create cars that are more green and more fuel efficient than many of their non-hybrid counterparts. So how do we determine which of these plug-in hybrids provide the best value? Both models are making a positive impact on the environment; however, the Clarity has a highly significant edge over its Prius Prime counterpart in the form of EV mode driving range. This range is based on the distance a vehicle can drive solely under electric power with no gasoline required. With an all-electric rating of 47 miles,* the 2018 Honda Clarity Plug-In Hybrid nearly doubles that of the 2018 Toyota Prius Prime Advanced at just 25 miles. A majority of our daily commutes will be covered by the Clarity’s electric-only driving range, while the Prius will undoubtedly require assistance from its gasoline engine or a recharge. Whether you have a longer-than-average commute or you are fond of road trips, both the Clarity Plug-In Hybrid and the Prius Prime Advanced can go much further than their electric-only range. With their hybrid technology and gasoline engines working in unison, they are able to obtain very respectable fuel efficiency ratings. 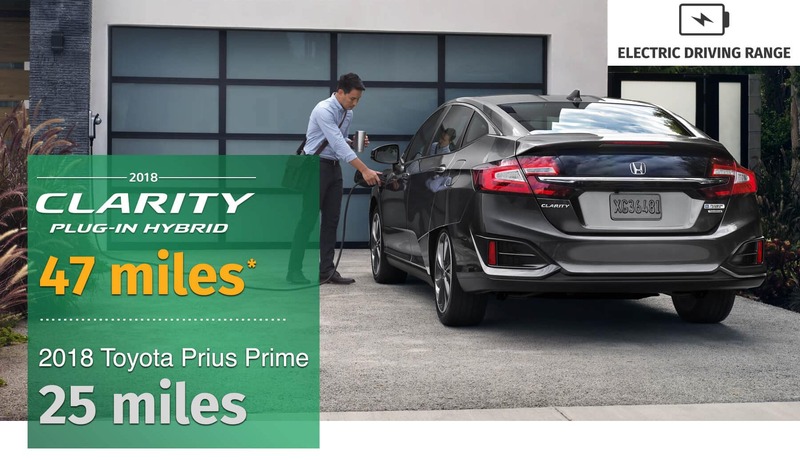 Yes, the Prius Prime does have higher figures when it comes to overall mpg, but keep in mind how much fuel and money is saved by utilizing the Clarity’s excellent, electric-only range. When driving a hybrid car like the Honda Clarity Plug-In Hybrid or the Toyota Prius Prime Advanced, horsepower is typically an afterthought. However, the Clarity proves that you don’t need to settle for a weak powertrain in order to obtain impressive fuel economy, besting the Prius Prime with more electric horsepower (181 hp vs. 71 hp), more gasoline horsepower (103 hp vs. 95 hp), and more combined horsepower (212 hp vs. 121 hp). In real world situations such as merging onto the highway, the Clarity’s sufficient horsepower will be greatly appreciated. Step inside these two hybrid cars and you will quickly notice only one is a true, midsize sedan. With seating for up to five and a maximum passenger volume of 101.5 cubic feet, the Honda Clarity has more than enough room for your family, friends, and cargo. Meanwhile, the Toyota Prius Prime can only seat four and has a max passenger volume of just 91.5 cubic feet. Not only does the Honda Clarity Plug-In Hybrid have a higher seating capacity than that of its Toyota competitor, but it also provides a much more comfortable ride for passengers. Across the first and second rows, the Clarity offers more legroom, more hip room, and more shoulder room than the Prius Prime. 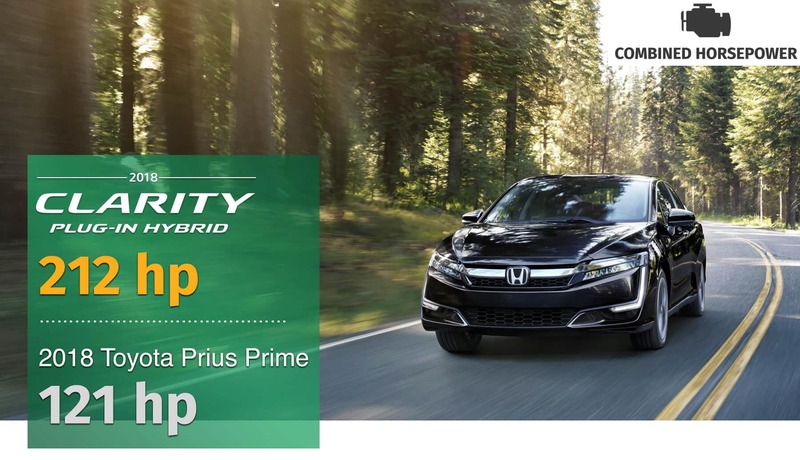 Although the 2018 Honda Clarity Plug-In Hybrid E-CVT is priced $100 higher than the 2018 Toyota Prius Prime Advanced, the Clarity will hold its value better over time, making that tiny difference even more insignificant. 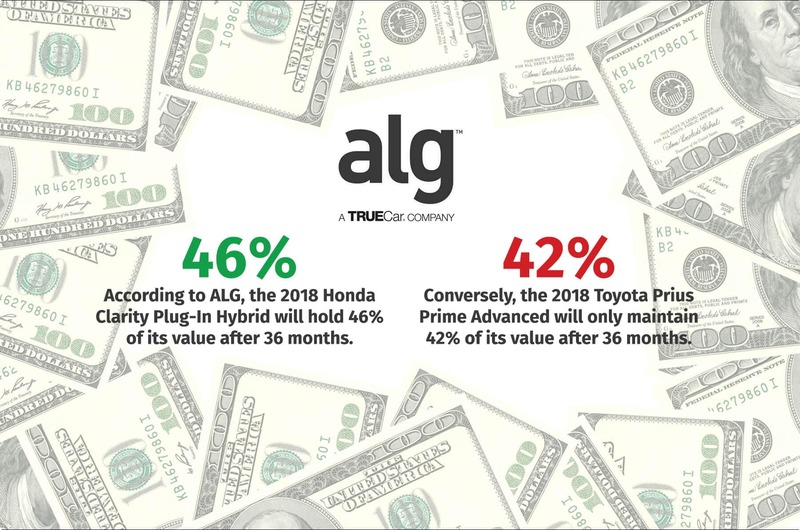 According to ALG forecasts for July 2018, the Clarity Plug-In Hybrid will maintain 46% of its value after 36 months,^ while the Prius Prime Advanced will hold just 42% after the same amount of time. At a glance, both the 2018 Honda Clarity Plug-In Hybrid and 2018 Toyota Prius Prime Advanced are similarly priced and equipped. But a deeper dive into their standard features might have you thinking twice about their MSRPs. Below, is a list ranging from technology to equipment, all of which can be found on board the Clarity Plug-In Hybrid but is absent from the Prius Prime Advanced. The Honda Clarity has not only caught the attention and earned the respect of many drivers, but it has also captivated auto experts. In the first handful of months since its release, the 2018 Honda Clarity Plug-In Hybrid has been awarded the 2018 Green Car of the Year® by Green Car Journal, the 2018 Edmunds CES Most Innovative Car of the Year, and Kelley Blue Book’s KBB.com 2018 Best Buy: Electric/Hybrid Car. Continue reading to see what other automotive authorities have said about the Clarity Plug-In Hybrid. 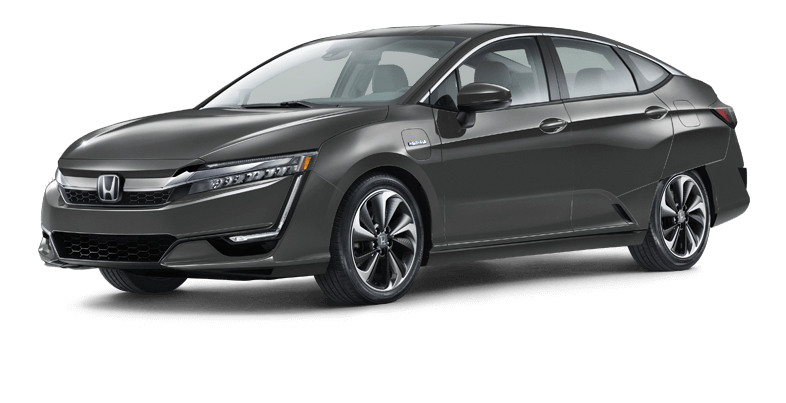 The Honda Clarity Plug-In Hybrid makes it much easier to distance yourself from the fuel pump and help make a positive impact on the environment. With a substantially greater EV mode driving range, more room for passengers, as well as a higher residual value and more standard features, Toyota will need to make a strong rebuttal with their Prius Prime to take our eyes off the Clarity. 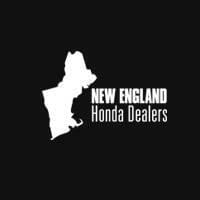 If you are as captivated by the all-new Clarity Plug-In Hybrid as we are, please visit a New England Honda Dealers location near you today—we’d love to show you around this award-winning hybrid. * 110 combined miles per gallon of gasoline-equivalent (MPGe) electric rating; 44 city/40 highway/42 combined MPG gasoline only rating. 47-mile maximum EV mode driving range rating. 340-mile combined gas-electric driving range rating. Ratings determined by EPA. Use for comparison purposes only. Your MPGe/MPG and driving range will vary depending on driving conditions, how you drive and maintain your vehicle, battery-pack age/condition and other factors. ^ Residual values based on Automotive Lease Guide, 2009. Residual values calculated using 15,000 miles annually. Residual values as of 7/16/2018. Autoblog, 2018. Visit https://www.autoblog.com/2018/04/30/2018-honda-clarity-plug-in-hybrid-quick-spin-review/ for more information. Kelley Blue Book, 2018. Visit https://www.kbb.com/honda/clarity-plug-in-hybrid/2018/ for more information. U.S. News & World Report, 2018. Visit https://cars.usnews.com/cars-trucks/honda/clarity for more information.